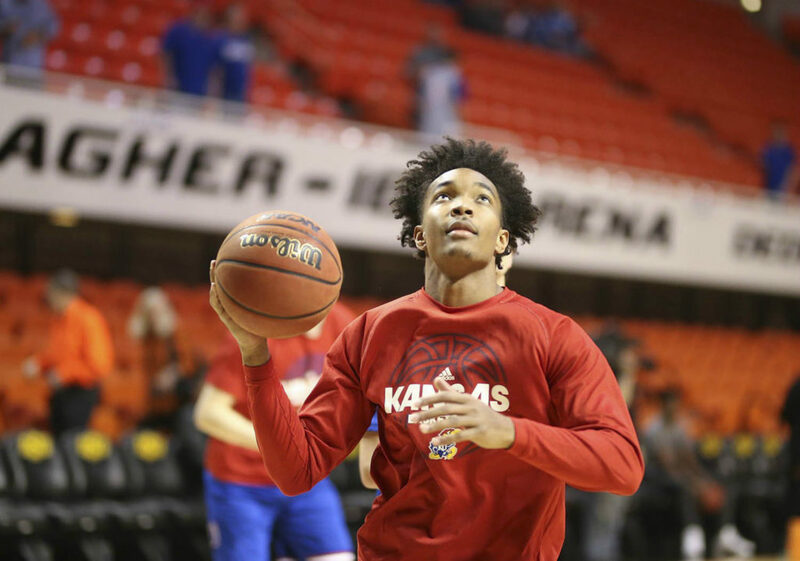 Kansas senior point guard Devonte' Graham warms up prior to the Jayhawks' regular-season finale at Oklahoma State, on March 3, 2018, in Stillwater, Okla.
Time: 1:30 p.m. | Location: Sprint Center, Kansas City, Mo. 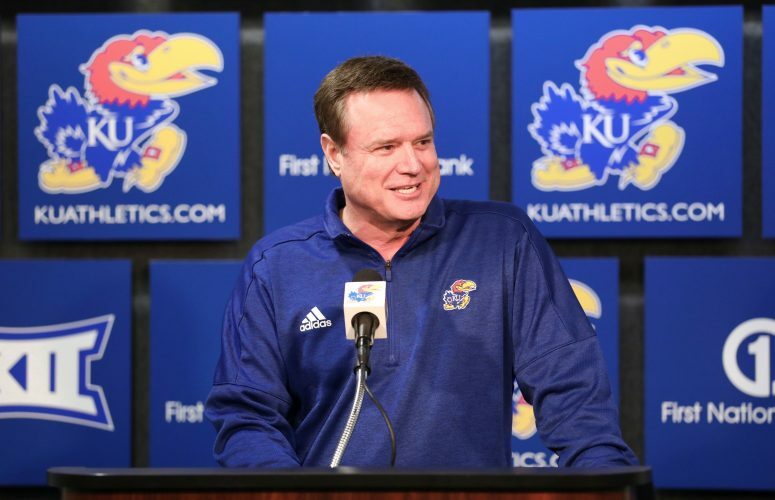 Kansas coach Bill Self said his team had a terrific week of practice — after taking Sunday off — up until the time sophomore center Udoka Azubuike was injured on Tuesday during a freak accident on what Self dubbed a routine basketball play. 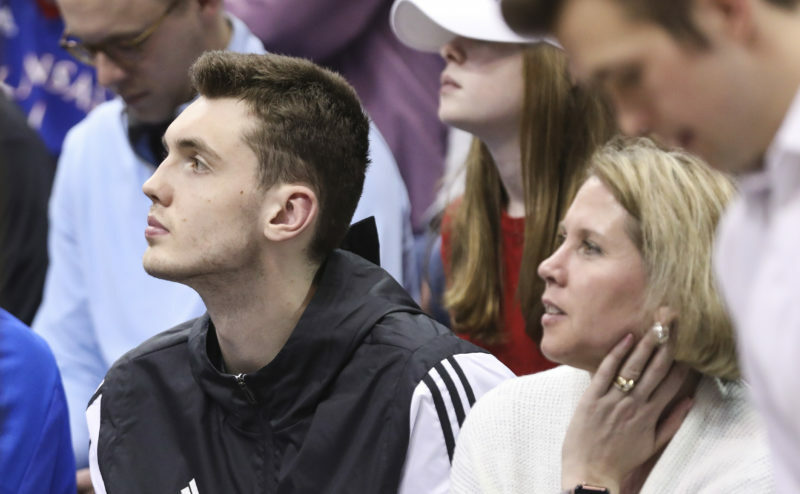 Even after that incident, which took place Tuesday and leaves Kansas without Azubuike for at least the Big 12 tournament, the Jayhawks continued to put in the kind of work that is both appreciated and required at this time of the season. The reason was simple. 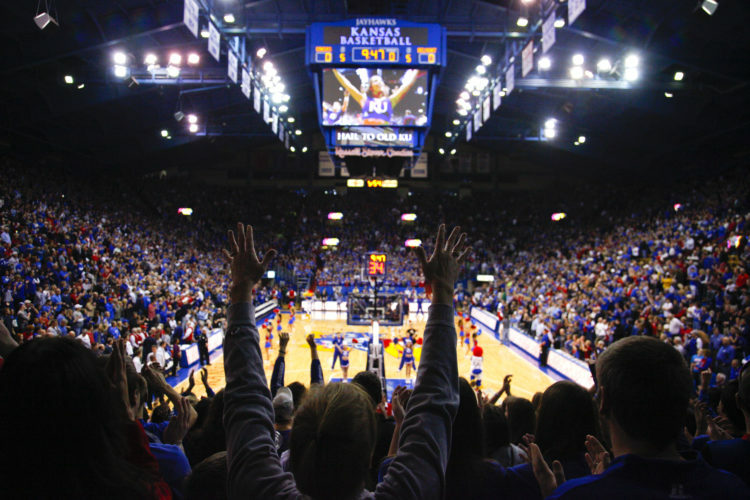 In addition to understanding that they’ve reached the most crucial part of the 2017-18 schedule, where it’s do-or-die every time out, the Jayhawks also are looking to put last weekend’s drubbing at the hands of Oklahoma State behind them. What better way to do that than by facing the exact same Oklahoma State team that handed Kansas its worst loss of the season in Stillwater, Oklahoma, last Saturday? Getting a win in their next game out, no matter who it came against, would have been a big lift for this inconsistent KU team. But doing it against OSU, should they be able to today at Sprint Center in Kansas City, Mo., would almost be like two victories and a big step toward getting this team rolling again headed into the NCAA Tournament. In two losses against the Cowboys, Kansas allowed OSU to top 50 percent shooting overall and 40 percent shooting from 3-point range. So something has to change, right? While the old adage that it’s awfully hard to beat a team three times in the same season is accepted in some circles and laughed at in others, the fact remains that Kansas cannot do what it did against the Cowboys in the first two meetings and expect the outcome to be any different. What’s that Albert Einstein quote about the definition of insanity? Anyway, with that in mind, expect something to be different for the Jayhawks in this one. Whether it’s something as simple as better effort, intensity and attitude from start to finish or something more complex like KU coach Bill Self throwing a junk defense at the Cowboys or playing more zone, Kansas surely will look and act like a different team than the one that was whipped by the Cowboys in Oklahoma last weekend. And OSU coach Mike Boynton knows it. 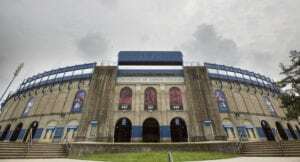 Although the loss of Azubuike is a huge blow to this KU team and will certainly be felt at all areas of the court throughout various portions of this game and whatever future games KU must play without him, the Jayhawks, in many ways, have exactly the right guys filling in for him. 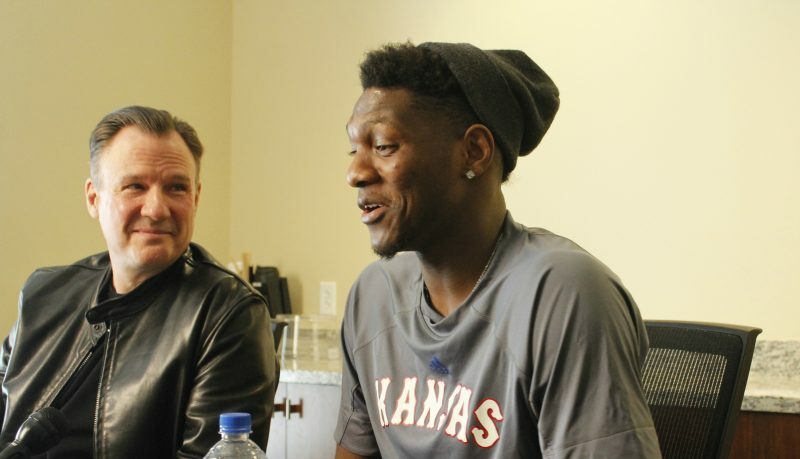 In sophomore Mitch Lightfoot and freshman Silvio De Sousa, Kansas coach Bill Self will be able to toss two players onto the floor who understand clearly that they are not the show and they are not being asked to score 20 points and grab 10 rebounds. Maybe combined those would be good numbers for the two to shoot for. But the real idea here is for them to do their best to control the glass, defend the interior and let Devonte’ Graham and company do their thing to lead Kansas to victory. While their importance goes up a great deal in this one, neither player has to be great for Kansas to win. And them trying to be might actually hurt the Jayhawks’ chances. Lightfoot and De Sousa should understand that. And because of that, it seems realistic to think they could actually do a good job of picking up Azubuike’s minutes and production, even if it looks slightly different when they do it. If you’ve watched the two previous matchups between these two teams, you already know about some of the key individual battles. Obviously, Kansas needs to find a way to slow down OSU point guard Kendall Smith (24.5 ppg vs. KU this season) and also find a way to contain sharp-shooter Jeffrey Carroll and big man Mitchell Solomon. All three are experienced players who have had good runs against KU this season. But one of the most important things to watch in this game is the ability of Lightfoot and De Sousa to stay out of foul trouble. KU needs one of these guys in the game at all times. And if they both get in foul trouble, particularly early, it’s hard to imagine Kansas having much success in this one. Clay Young was great in extended, first-half minutes against Syracuse, but I’m not sure he’d have the same success — or opportunity — in relief of De Sousa and Lightfoot if foul trouble plagues those two. KU likely would turn to a five-guard lineup at that point. And, while that might give the Jayhawks some advantages, it would leave them incredibly vulnerable in a couple of other areas. So it’s important for Lightfoot and De Sousa to play hard and be strong, but they also have to be smart. Fouls that come from good effort are acceptable. But those silly ones — moving screens, fouling 80 feet from the OSU basket, etc. — must be avoided. 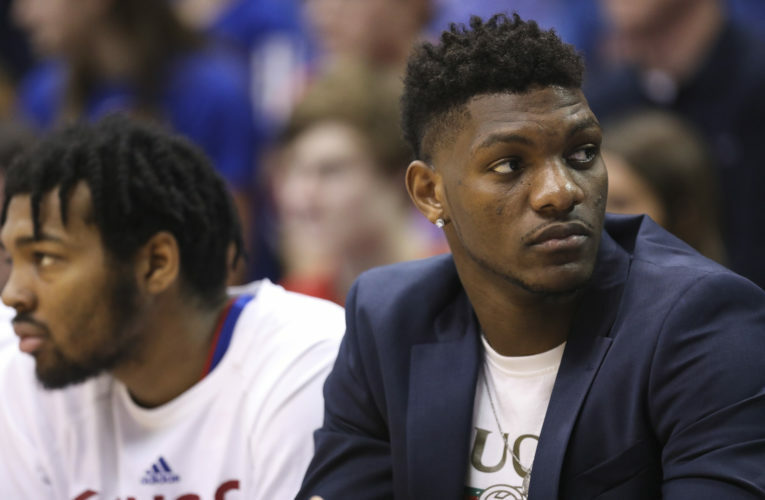 While losing Azubuike to injury changed the outlook of this weekend’s Big 12 tournament from “Let’s go win the thing” to “Let’s see what happens,” all is not lost for Kansas. The Jayhawks still have an incredible and talented leader in Devonte’ Graham, they’re still coached by a Hall of Famer on the sidelines and they still have a lineup that can be deadly if things are clicking and this team is playing together. Graham said after Wednesday’s practice that Kansas might have to rely even more on making shots now that it can’t throw the ball down to Azubuike on offense. And, heck, even Self said the Jayhawks might have to shoot more 3-pointers or play more zone with the 7-footer out of the lineup. Who is this guy? So with that being their reality, and the Jayhawks not really having much to lose — other than a third game to the same team in the same season for the first time since Oklahoma State did it in 1983 — the Jayhawks figure to take the floor a confident bunch ready to let it fly. That’s exactly what the Oklahoma State coach is expecting and things figure to be drastically different out there today than when these two teams locked horns earlier this season. G – Devonte’ Graham, 6-2, 185, Sr.
G – Malik Newman, 6-3, 190, Soph. G – Svi Mykhailiuk, 6-8, 205, Sr.
G – Lagerald Vick, 6-5, 175, Jr.
F – Mitch Lightfoot, 6-8, 215, Soph. G – Kendall Smith, 6-3, 190, Sr.
G – Jeffrey Carroll, 6-6, 220, Sr.
G – Lindy Waters III, 6-6, 205, Soph. F – Cameron McGriff, 6-7, 220, Soph. F – Mitchell Solomon, 6-9, 250, Sr.